As can be inferred from the congruity of Thich Nhat Hanh’s and Ezra Bayda’s views, Zen teachings often remind us that happiness is to be found in the present moment, and that our notions of happiness, especially notions based on external conditions, only stand in our way. Yet in speaking of “releasing” our ideas of happiness, Thich Nhat Hanh has given this familiar teaching a fresh and energizing turn. Derived from the Latin relaxare (“to relax”), the word release connotes freedom from confinement. Alternatively, it suggests the relinquishing of a right or claim. To speak of releasing our ideas of happiness is to suggest that we have been holding those ideas captive. We can let them go free. The word release also implies a claim to what Bayda would call a “birthright” or “sense of entitlement,” which is to say, a right to be happy on our own terms. To release that claim is to liberate ourselves from the suffering that ensues when the claim proves illusory, the sense of entitlement a hindering fiction. By releasing our ideas of happiness, we open a path to genuine happiness, whose roots lie in a wholehearted, open-minded embracing of our lives as they are. And just as our ideas of happiness can be released, so can our other ideas, especially those that may be causing harm. The Buddha famously said that the aim of all his teaching was the end of suffering. Elsewhere he declared that nothing whatsoever is to be clung to as “I” or “mine.” The latter statement is sometimes understood to refer to material possessions, but it can also refer to our ideas, especially our fixed ideas, to which some of us cling at all costs, regardless of their tenuous connection to reality or their potential to inflict human suffering. To take but one example, there is the fixed idea of austerity, to which European governments have, until very recently, been clinging with all their might, against the best advice of Paul Krugman and other world-renowned economists. Whether that idea has been more toxic than beneficial is open to debate, but the tenacity of those who have embraced it has been self-evident. To speak of clinging to ideas, economic or other, is not to denigrate thought or imply that thinking is inevitably linked to suffering. Without its ideas, the human mind would be a barren estate and the world a poorer place. What Zen teachings caution against is not intellection itself but our tendency to cherish and protect our ideas, as if they were private fortunes, and to identify with those ideas, as if they were us, and vice versa. In reality, as the modern Zen master Kosho Uchiyama has put it, most of the ideas that cross our minds are as accidental as they are transient. To the extent that we are unaware of their comings and goings, we may view them as real and substantial—and fasten on them accordingly. By contrast, to the extent that we can live in awareness, we can see that our ideas, along with our memories, fantasies, and other mental phenomena, are no more solid than the chirp of a robin or the rumble of a passing truck. In a classic analogy from Zen teachings, our thoughts are likened to clouds in the sky—the sky-like nature of awareness. With practice we can learn to see them as such, while also observing our habitual clinging. In this way, we can, in Uchiyama’s words, “open the hand of thought,” releasing our pet ideas as if they were captive birds. If you would like to test this proposition, may I suggest that you sit still in a comfortable, upright position and bring your awareness to your lower abdomen. Observe its rise as you breathe in, its fall as you breathe out. After a few minutes, shift your attention from your body to your mental life, and allow your awareness to illuminate your thoughts. Observe their arrival, duration, and departure. Note any tendency to pursue or cling to particular thoughts. At the same time, sense your capacity to release your thoughts, even those you most value. Practice this ten-minute exercise daily for a week or more, and see what becomes of your fixed ideas. 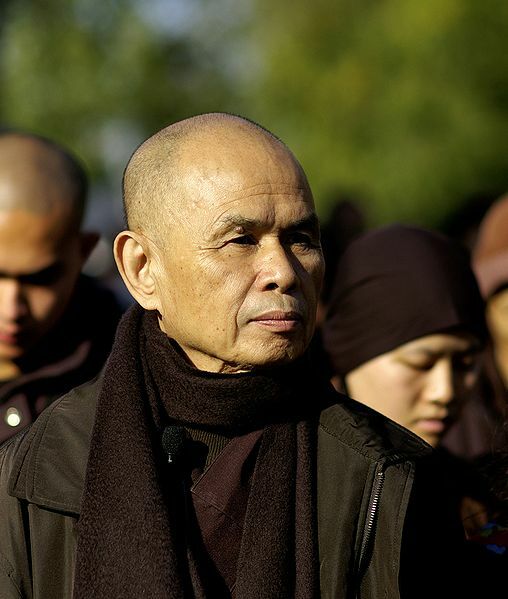 * Thich Nhat Hanh, “Cooling the Flames of Anger,” Dharma talk, Dublin, Ireland, April 11, 2012. http://tnhaudio.org/2012/04/18/cooling-the-flames-in-dublin/. ** Ezra Bayda, Beyond Happiness (Shambhala, 2011), Kindle edition, 2060, 2091, 849.